….is a whole lot like this. Yeah. That’s not a good feeling. We spent months to get that done. For the first time as a young Marine Lieutenant in Afghanistan, our couple steps forward seemed like they’d just been followed by a big leap back. We had carefully learned the needs of the villagers, had painstakingly hired contractors at an exorbitant rate and reassured them through their anxieties about the Taliban stopping them. Had patrols out to check on them and make sure the work was getting done, that there wasn’t interference. And then it was all gone. Worse, it looked like we didn’t know what we were doing. We really were close. The villagers had told us they needed water. We had spent hours sitting and talking with them on patrols, asking about their needs and wants, their hopes and fears. They told us they needed many things: a way to better grow food to provide for their families, tractors to plow fields, fertilizer for the bad soil (it’s a desert) access to irrigation water, protection from the ‘dushman’ (bad men) that came in the night, schools for their children, better roads, documents and deeds for their land claims. The list went on. Water for drinking seemed to come up a lot in our surveys, it seemed pretty painful: they had to ride on dirt bikes or with donkey carts to haul water from villages miles away, it seemed like a pretty good place to start for a quick impact. Did you catch where we went wrong there? Veterans are particularly exceptional at two things: accomplishing missions and taking care of their troops. Creating experiences is key to this. See we had been trained in this. We had relentlessly trained in the two key imperatives of the military: we accomplish the mission, and we take care of our people. This consistent focus was further sharpened in our training for counter-insurgency. The key insight in modern counter-insurgency doctrine is the focus on the population. It is crucial for the military to understand the environment, the adversary, the terrain, and the capabilities of their own organizations. 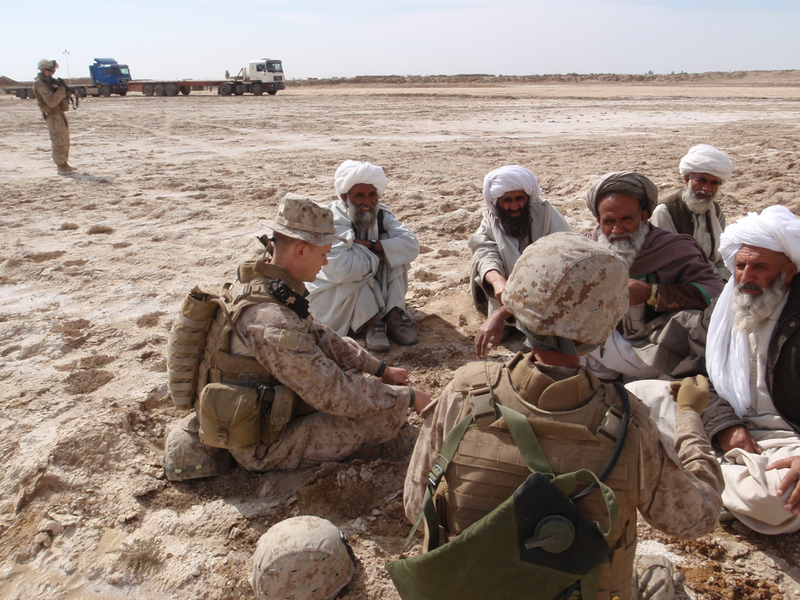 In counter-insurgency, the most important part of the environment is the people, and they are a living, acting force. We convince the population that we understand them and can meet their needs better than the opposition. Design thinking is a framework for better understanding the needs of a group and designing ways to meet and exceed their needs. It’s been popularized by boutique design consultancy firms, it has been implemented by consumer packaged goods companies, automobile manufacturers and each and every maker of every app on your smartphone. IBM’s Enterprise Design Thinking takes that approach and scales it to the enterprise. At its core Enterprise Design Thinking helps teams deliver better experiences. So where can you apply design thinking? It works best in the service of people. It shines when we deploy it in the planning, designing, and execution of an experience, product or service that is ultimately consumed by humans. I like to think of Enterprise Design Thinking not just as a ‘tool in a toolkit’ (a common phrase in the military), but one of the most powerful operating systems available to people. It can be installed in your mind (the computer you always have with you), and you can use it to approach every problem you tackle, particularly those that deal with other people. If always having this system with you and being able to apply it almost universally weren’t enough, it allows for continual iteration and encourages learning. In the same way that Machine Learning works by training toward outcomes based on data, so too can we refine and iterate our use of this system toward better and better outcomes. Here’s where veterans have some advantages. We already know how to design experiences. We design experiences for new members joining our military service branches. ‘Boot camp’ has its impact and meaning as a term, and has been adopted particularly by the software industry, because of the experience our culture created for outcomes we wanted: rapid cultural adaptation and basic skills acquisition. We design experiences for the welfare of our teammates. ‘Troop welfare’ the enduring peer of military mission accomplishment is itself an experience we constantly design for our teams. And we design experiences for the populations we are tasked to protect. My team worked to design an experience for the population in our nearby villages where their lives were made a bit better by our presence. We worked to meet needs we identified by interviewing them, by surveying the lives they lived, and observing they did not have drinking water, and we thought we had an opportunity to make an impact. How we could have done better. We could have looked closer and dug deeper, asked more about those ‘bad men’ coming in the night, and whether they might do more than just put bombs in the ground intended for us Americans to find. We could have asked where the villagers went for their water, and why those places had the wells and pumps, and our villages didn’t. We could have asked our Afghan Army counterparts how they got water in their own home villages, or how they’d seen this problem solved in their decades of warfare. We could have wondered if we might need to look beneath the surface of what we were hearing, to the deeper underlying problem: the security of the village was not robust enough for anyone to invest in building wells, and wells installed by us would absolutely become targets. The villagers must drive an hour to get drinking water. (1) Why? Because there are no wells deep enough for drinkable water inside the village, but there are in villages an hour away. (2) Why? Because no one has invested in building drinkable wells in the nearby villages but have in the distant ones. (3) Why? Because the near village, unlike the distant one does not offer potential for return on investment -whether by the villagers themselves or entrepreneurs. (4) Why? Because unlike the tiny shops we’ve seen public wells can’t be enclosed in walls and the security situation in nearby villages, unlike those in distant villages is weak. (5) Why? The local security provided by Afghan security forces, augmented and trained by Americans is not pervasive enough to protect people and infrastructure at all hours and all days. What that says about design thinking. Design thinking trains us to be iterative. We can apply all the lessons we’ve learned, only to run into a situation that teaches us that there was another need hiding under the ones we uncovered. There may have been other stakeholders that could have told us if we’d known how to ask them. This is absolutely true in designing elsewhere, whether in software, processes, objects, or in any other human-centered experience. It demonstrates that design thinking is a journey, one that doesn’t end. Where the only constant is the need to continuously observe, reflect, and make. To remember that we aren’t our users, and build empathy not only for them but for each other. What that says about veterans, and why IBM likes that. Veterans have already seen practical applications of understanding human needs. 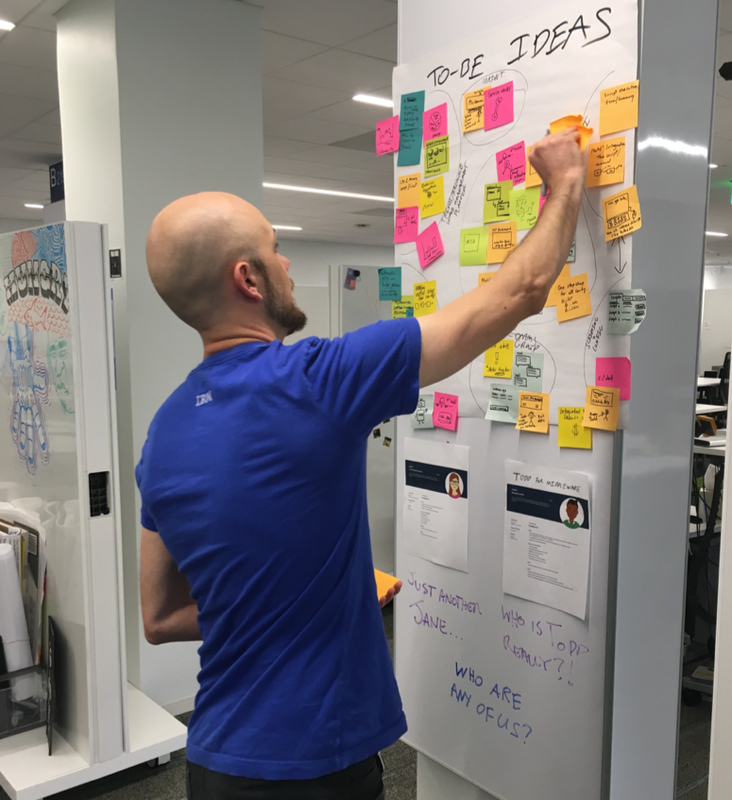 We’ve planned for creating experiences, we’ve interviewed our ‘users,’ we’ve examined their pain points, and collaborated cross-functionally on solutions. We’ve made ‘as is’ and ‘to-be’ scenario maps for those solutions. We’ve learned from the mistakes that we’ve made and shared them in our After-Action Reviews or Retrospectives. We’ve learned little bits here and there about asking another question, looking a little closer, digging a little deeper. We’ve got a head start on the experiences needed to inform the iterative learning on this framework. By adding these tools and methods, and framing them just a little more generally we can apply this experience and these methods to virtually any problem! IBM Values this experience in Veterans and our commitment to accomplishing missions while taking care of one another. To that end, IBM has committed to hiring an additional two thousand veterans by 2020 through the Vet 2K hiring initiative. IBM has also offered training, targeted specifically to veterans in some in-person training programs. And through the New Collar initiative, IBM makes many trainings available online for free. Learn more about Enterprise Design Thinking and how you can bring it to your own teams here. Richard is an Offering (Product) Manager at IBM based in Raleigh, NC. The above article is personal and does not necessarily represent IBM’s positions, strategies or opinions.